Image: Jeff Kravitz/FilmMagic; John Shearer/Getty Images for People Magazine. 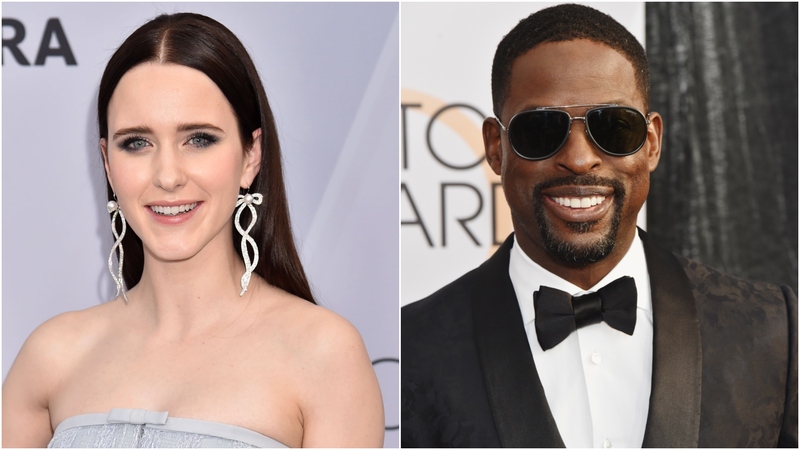 ICYMI, you aren’t the only one obsessed with This Is Us star Sterling K. Brown or The Marvelous Mrs. Maisel’s, well, marvelous Rachel Brosnahan. And no, we aren’t just talking about our undying love for both of these oh-so-talented entertainers — they had a mutual lovefest on the pre-SAG Awards red carpet Sunday night, and Brosnahan may have even gotten her dream guest star out of the moment. It all went down just shy of the SAG Awards ceremony, when Brosnahan happened upon Brown and his wife, Ryan Michelle Bathe (who we’re also obsessed with, naturally), in the midst of an interview. Unable to resist, Brosnahan crashed the conversation to gush about how much she would love to have Brown on the Amazon series in which she plays the title role. “I would give anything to have this one on The Marvelous Mrs. Maisel, or a part of anything!” Brosnahan said, with Brown interjecting, “I would go crazy.” Apparently he isn’t exaggerating, either. Bathe confirmed to Brosnahan that she would have to “give him a Xanax” to keep him from geeking out on set. He also had extremely complimentary things to say about The Marvelous Mrs. Maisel, which he and Bathe obviously watch together. “The show is just done at such an incredibly high level. It’s so funny, it’s so full of heart, it’s so specific. Like, I love the specificity of the world and I would love to step into that,” Brown explained. Wait, so is this really happening? ’Cause if so, we might need a Xanax, too.